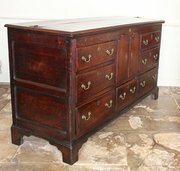 DescriptionEarly 19th century Oak Mule Chest with drawers. 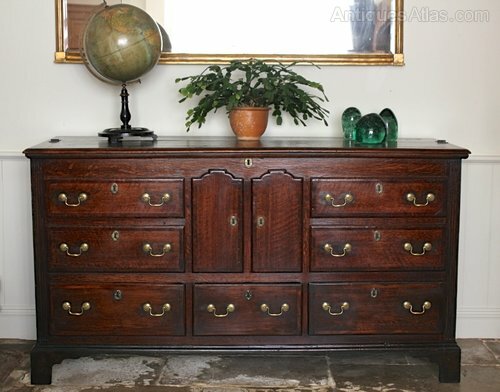 Constructed in the classic oak tradition, with panelled sides, it is made to look like a dresser with drawers and central cupboard, but instead it is a chest with 3 drawers below. 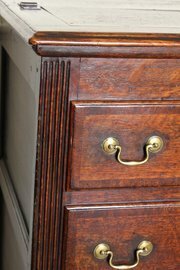 The upper drawers and shaped central panels are decorative. The plank top has been altered, split and hinged to allow easy access to the chest interior without having to remove all items from the top surface. 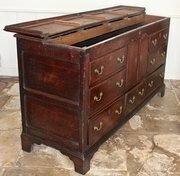 Mahogany crossbanding to the top and drawer fronts, reeded corners, and a good warm oak colour makes this Mule Chest an attractive piece of antique oak furniture to live with. Circa 1800.